What do you normally do when you find yourself short on business storage space? Do you carry on regardless, piling boxes on top of boxes or filling up cupboards? Do you make use of cheap but poorly secured lockups? Do you load up a van and pay for business storage units at a warehouse? Another option which is growing in popularity is to order mobile business storage units where your excess stock, furniture or documents are collected from your premises and taken to a nearby secure storage facility. Free up space. Some businesses use the extra space to set up another desk which they then hire to freelancers or other small businesses. Organise your office. Cluttered offices become disorganised which means lost files and poor customer service. No more vans. You don’t have to worry about diverting a van and driver from their work. Or hiring a van from a rental service. Mobile business storage units are delivered to and collected from you (see our process below for more details). Only pay for the units you need. Once you’ve booked space in a warehouse, you normally have to honour that cost regardless of how much space you use. With mobile business storage, the price depends on the number of units needed giving you fine control over cost. 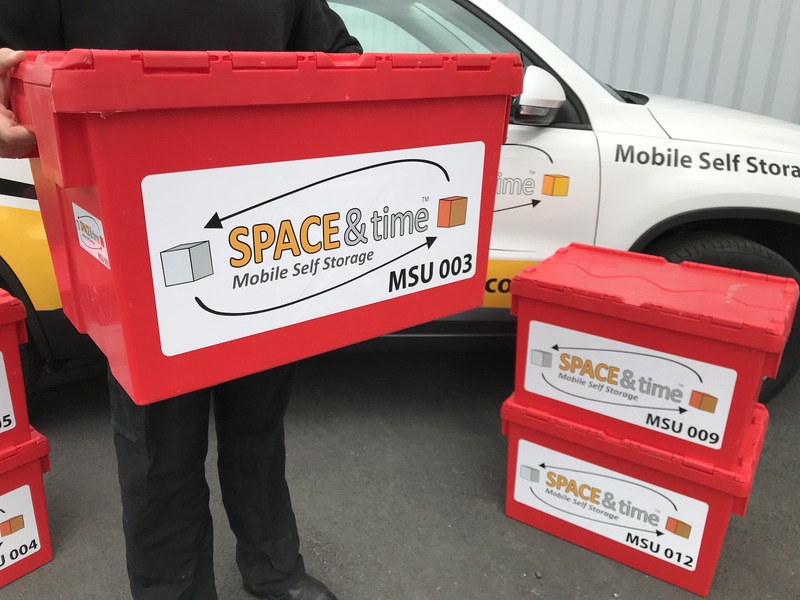 With 15 years’ experience in the self-storage industry, you can trust Space and Time to handle any of your business storage needs. To get started with ordering your mobile business storage units, click the ‘Get Started’ button on the home page of our website (you can access via any device). Choosing the number of cartons you will need (unused boxes will be collected and taken off the price). Booking a date and time slot for receiving your cartons and packing supplies. Booking a date and time slot for collection of your boxes and other items. Choosing a location, date and time slot for return of your items. As you progress through the online booking system, the overall cost will be updated. If one extra box would push up the price you can reduce or compact your items to keep costs down. Flexible terms. Store one box for a few weeks or 30 boxes plus additional items for a few months. Additional items accepted. Not everything fits in a box. We can take office furniture and equipment, mirrors and pictures, promotional items and more. International coverage. Our UK-wide network of drivers and vehicles and professional shipping service means we can return your items to any mainland address in the UK and most global cities. So the next time you feel ready to clear out your office to rent out desk space, organise your files or prepare for an office move contact Space and Time on 0161 207 1260 or simply click the ‘Get Started’ button.